"How Do Rookie Financial Advisors With ZERO Prospecting Experience Consistently Humiliate Veteran Advisors Who Have Been Struggling to Get Clients for Years?" Want more clients? Read this. Then this letter is NOT for you. However, if you’re someone who is willing to pay attention and follow simple instructions, then this will be the most profitable letter you'll ever read. Please understand my results are not typical. I’m not implying you’ll duplicate them (or do anything for that matter). The average person who buys any “how to” information gets little to no results. As with all of my products, my references are used for example purposes only. I've had years of experience marketing, prospecting, and getting clients. My personal results should be considered exceptional. All business entails risk as well as massive and consistent effort and action. If you’re not willing to accept that, please DO NOT GET THIS. This book, available in an instantly downloadable PDF format, is chock-full of client-getting tips that are working right now. It's one of my best-selling products because it contains priceless information that helps advisors improve their most important skill... getting more clients. How to reverse-engineer the activities you need to take in order to meet your income goals. (And it's so simple, you'll master it in about five minutes.) Page 10. Forget all the complicated stuff you’ve learned about building a business - in reality, there are only two simple things you need to focus on. (You'll probably never hear about this anywhere else.) Page 15. Several valuable golden nuggets of wisdom I wish I knew years ago. This will help you avoid the mistakes I made. Page 17. “Small business owners” is NOT a niche. I’ll show you how to dial in on and dominate a target market. (You can do this whether you're a brand-new rookie or experienced veteran.) Page 23. My unique recommendation about niche marketing that goes against everything you’ve ever heard. Page 27. Four types of people you’ll encounter as a financial advisor and how to deal with each one. (Not one advisor in a hundred was able to clearly identify these four types of people, yet alone how to take them from prospect to client. Fortunately, I'll spoon-feed you everything.) Page 33. One little sentence which changed my life was “Nobody ever screams in a Mercedes commercial”. Find out why. Page 34. The three biggest things people want from their financial advisors - if you provide these things, you will be light years ahead of your competition. Page 42. How to figure out when your mailing is a winner, so you can scale it out and skyrocket your revenue. Page 48. When you’re trying to speak for associations and seminars, a meeting planner has two basic fears. I’ll tell you what they are and how to overcome them. Page 52. Several ways to overcome your fear of rejection and turn into a superstar prospector. (This advice is so potent, I gave it to an inside sales rep at a major bank - who had the worst case of call reluctance I've ever seen - and he was "smiling and dialing" effortlessly by lunchtime.) Page 64. Four traits of the world’s best prospectors. Page 72. Why prospecting is NOT about building relationships. There’s a specific way you should be prospecting, and it doesn’t involve being a Chatty Cathy. (Even experienced advisors get this wrong.) Page 74. The words that diminish your chances of success during a sales conversation. Avoid saying these words at any cost. Page 80. My social media “secret weapon” - which is utterly simple to master - and how you can use it to crush your competition. Page 94. Exactly what to say when connecting and messaging your prospects on LinkedIn to maximize your chances of getting a response. (This is so easy to do, you can do it immediately, even without practice.) Page 99. Just met a prospect at a networking event? I’ll show you how to handle the follow-up process. Page 107. The Direct Marketing Association reported that direct mail is seven times more effective than email, mobile, social media, internet display, and paid search combined. Do you know how to turn your mailbox into a money-making machine? I’ll show you how. Page 117. 48% of people retain their mail for future reference. Learn how you can be the one they call when they need a financial advisor. Page 120. I’ve tested thousands of direct mail pieces and I share with you my biggest findings. Page 121. I reveal how 58% of wealthy investors found their financial advisors - so you can boost the chances of them finding you. Page 124. The big “secret” behind all effective follow-up. Page 131. How to follow up with a prospect to increase the likelihood of setting an appointment. It’s like I’m holding your hand and walking you through the entire process. Page 134. Should you ever abandon a prospect? If so, when? Turns out there’s a very specific, science-based answer. Page 138. 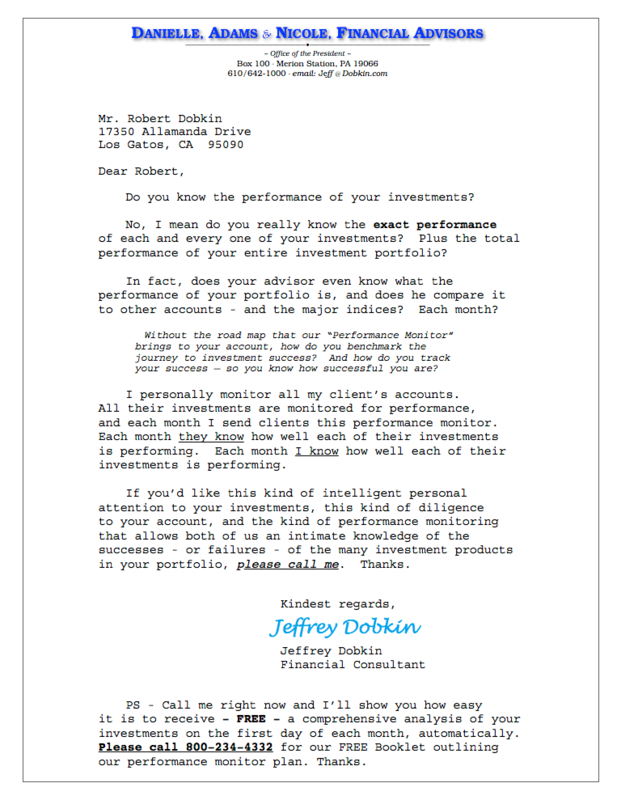 The greatest financial advisor sales tactic of all time. If you learn this one simple thing, this guide will pay for itself many times over. Page 143. The “productivity hack” used by the world’s most successful financial advisors. Page 146. My own personal productivity tips I’ve used to get more done in less time than ever before. Page 151. Plus, this guide contains eighty of the exact coaching questions I’ve used to put financial advisors on the fast-track to success. These coaching questions alone have the power to double or triple your business. In fact, because they're so effective, I’m thinking of offering them as a standalone product, Now is a good chance to get them while they're included in this book for free. The “cost” of this book is $97 and it comes with a 100% money-back guarantee, which is explained below. As soon as you place your order, you’ll get an automated receipt with a link to download the book directly in your email. You can access it anywhere, immediately, without having to wait by the mailbox. I realize this is very inexpensive (especially compared to what it’s worth), so you might wonder what the “catch” is. I’m literally giving you some of the most powerful client-getting information a financial advisor can possess because I want to demonstrate real value to you. My hope is that you’ll love it so much you’ll buy my other products. How’s THAT for transparency? I’m not getting rich with a one-time $97 sale because I make my money from building a good business relationship that lasts for years. How much is one client worth to you? What if you only get three extra clients per year? Would it be worth the investment? Of course there’s a money-back guarantee. I would be SHOCKED if you weren’t able to get at least three new clients per year as a result of what I'm sharing with you. When you read this, you'll see that this is an extremely conservative number. In fact, I believe it would take more effort to screw this up than to just follow directions and get results. Either way, it doesn't matter because I offer this guide with an ironclad, zero-risk, 365-day money-back guarantee. Try out this book for a FULL YEAR and if you don’t feel that it's worth 10X what you paid, I will give you a prompt and courteous refund. You don’t even have to send anything back. Just email me (james@theadvisorcoach.com) or give me a call at 937-REVENUE and I’ll give you back your $97 with no questions asked. Click the "add to cart" button to claim your copy now. ​Thanks for taking the time to read this letter and I look forward to hearing from you soon. I’m offering you one of my best-selling books, which I wrote to help financial advisors get more clients… plain and simple. There is no “catch” to this offer. 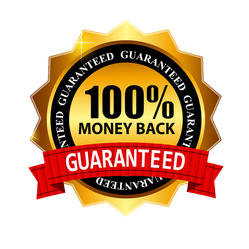 In fact, it comes with an ironclad, zero risk, 365-day 100% money-back guarantee. If you don't feel like it's worth 10X what you paid, let me know and I’ll even give you back the $97. You don’t even need to send the book back. Click the “add to cart” button and claim your copy now. You won’t regret it.